Being a mom is dang hard work! In fact, it’s the only job that I can think of that doesn’t offer overtime (or any pay at all), time off, bonuses, awards of recognition, etc. Being a stay-at-home mom to a toddler and newborn, I’ve found that in order to be the best possible mother for my children, I need to take a little “me” time each day to rejuvenate. Are you an overwhelmed mama? Learn how to relax a little with these 10 Free Ways for Moms to Relieve Stress. I received samples and compensation on behalf of Hallmark in exchange for this post. All opinions are my own. 1. Bubble Bath: After the kids go to bed, fill up the tub, light the candles, and play soothing music as you soak away your stress. 2. Exercise: A breath of fresh air works wonders in stressful situations. 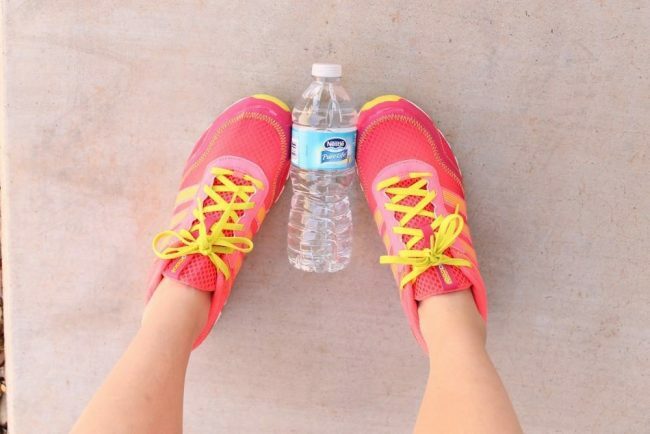 Go for a walk, jog, or sprint around the block. Lifting weights is also an awesome way to relieve a little tension. 3. Hobbies: Have a hobby you can look forward to at the end of your stressful days. Read a book, scrapbook, bake, etc. 4. Learn to say “no”: There’s no quicker way to relieve a little stress than cutting down on your commitments. Don’t be afraid to say “no” when you know your sanity can’t handle one more commitment. 5. Listen to music: Put headphones, close your eyes, and crank up the tunes! You could also take the opposite approach and play soft, calm music! My music of choice always depends on my mood. 6. Call a friend: Nothing helps me sort through my mommy stresses like calling my best friends. Having the support of another mom sure goes a long way. 7. 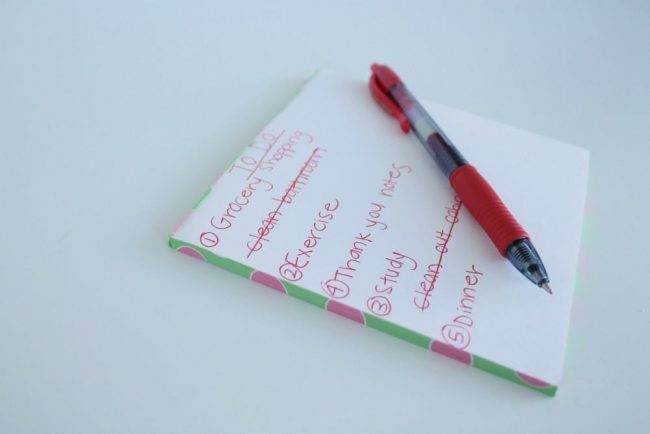 Make a list: If you find that you have too much to do and don’t know where to start, make a list of everything that you need to get done that day. Go through the list and number the items based on importance. If things can wait for another, cross them off your list. 8. Take care of yourself: Pamper yourself – paint your nails, put on makeup, shave your legs. Focus on YOU. 9. Quiet time: Lock yourself in your bedroom for ten minutes. Turn off the lights, close your eyes, put in ear plugs if necessary, and do absolutely nothing. 10. Veg: Turn on your favorite show, sit on your couch, kick up your feet, and relax! This is probably my favorite way to calm my nerves and reduce the stress in my life. 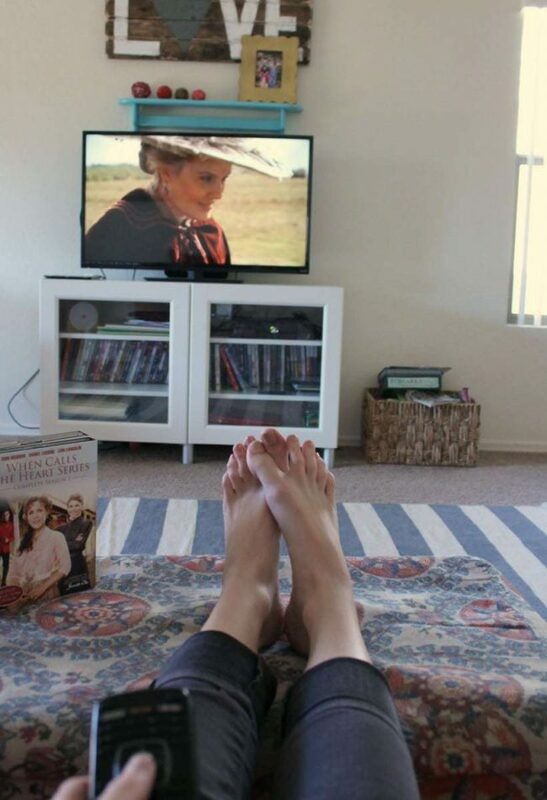 I don’t know about you, but I’m always looking for a new “girlie” show to help me relax at the end of my day. Looking for something packed full of drama and romance? 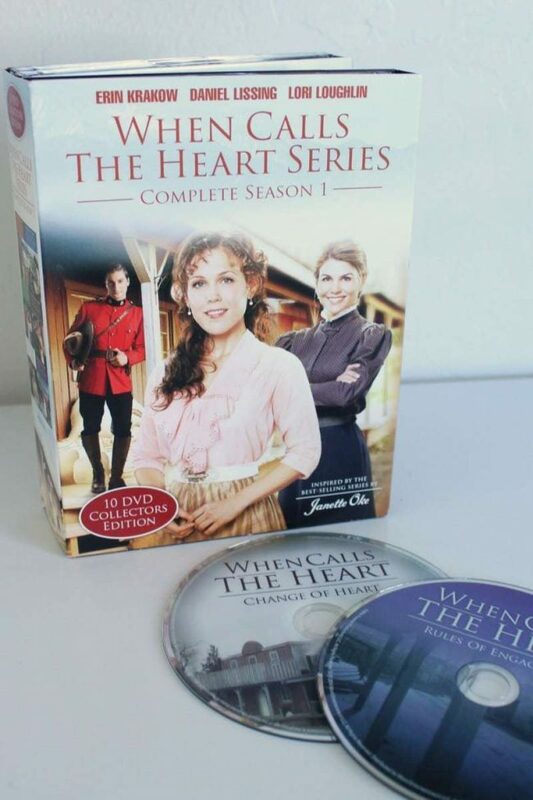 You’ve got to check out Hallmark Channel’s Original Series “When Calls The Heart“. “When Calls The Heart” tells the story of a new and high-class teacher named Elizabeth (Erin Krakow) who receives her first teaching assignment in a small and simple coal-mining town, Coal Valley. The town has just been struck with grief as a woman named Abigail (Lori Loughlin), along with a dozen other women, recently lost their husbands in a coal mining accident. These women must go to work as miners in order to provide for their families. Meanwhile, Elizabeth struggles to gain approval from Constable Jack Thorton (Daniel Lissing) who believes he’s been had by Elizabeth’s wealthy father. Elizabeth realizes that if she wants to fit in, she’s going to have to leave her high society life behind and become accustomed to rural west living. I won’t give away any spoilers, but let’s just say that season one if full of drama, tragedy, and romance. Best of all, the season 2 premier of “When Calls The Heart” is right around the corner! Be sure to tune in on April 25th at 8/7c for a captivating 2 hour episode. As season 2 kicks off, the citizens of Coal Valley are faced with adversity awaiting justice from the coal mining tragedy. Not to mention, romance is in the air. What could be better? Useful tips! My favorite was vegging out. Sometimes you need to blank out for sometime, then it will all be in better perspective. Exercising also helps to a great extent along with a good diet. I’ve been implementing many of these as I’m striving to take better care of myself. I’ll take all the stress relief I can get. A bubble bath and a good series is my favourite way to relax. This Hallmark series looks like an awesome one to curl up on the couch and watch. I really love to watch TV when it rains or at night. I have to catch up on some good Netflix shows. These are great ways to relax. I love to have a long soak in a hot bath to relax. A nice bubble bath sounds perfect today. Even though it’s nice outside, I can’t seem to get warm. I’ll have to wait until naptime or bedtime; otherwise the banging on the door will ruin the relaxing nature. I love to talk a walk by myself or get in the car and listen to music. You must take time for yourself! I can’t remember the last time I took a bath. Our bathtub is old and it’s really small. But I do find a long hot shower to be relaxing. I love bubblebaths. Will have to check out this show. When I need to relieve stress I grab a good book and take it with me into a hot bath. Usually a glass of wine accompanies us. Exercise is what relieves my stress. A good run puts all of my problems in perspective. Looks like a great show! It reminds me of Dr Quinn and I loved that show, I will have to check it out! My favorite way to relieve stress is a good ol bubble bath! Always works especially if I lock the door and am not disturbed! I should really remember this the next time I’m getting stressed. I normally default to reading! This is a great list of ways to relieve stress for everyone, not just moms. I know I could totally go for a bubble bath right now! Walking is one of the best ways for me to relieve stress. I try to take a walk every day. There’s nothing like vegging out to really make you feel better. Sometimes it’s nice to just do absolutely nothing. These are awesome tips! There was a time when I thought I needed a spa day to relax. Now, a nice bath and a book are just the thing for me. Amen to the bubble bath. That’s my #1, too. No one can get in with me, or talk to me, or anything. It helps with my back pain, too.